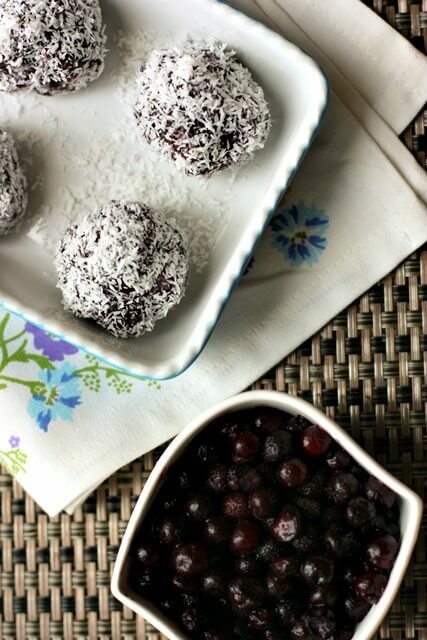 This recipe makes about 8 balls, double as needed. Process the nuts, dates, vanilla and almond butter in the food processor. Then add frozen (not thawed) wild blueberries and process again until well blended. Wet your hands a bit and roll mixture into balls. Freeze balls for an hour or so to harden, if needed. Then remove from freezer and roll in the coconut. I do this in a bowl. If you want them soft, store in an airtight container in the fridge. If you want them super cold, store in the freezer! Both are delicious.